The Capitol dome with scaffolding around its base last fall. 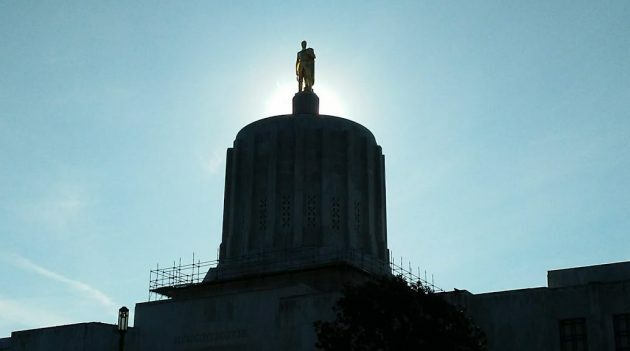 The 2019 legislature has organized itself in Salem. From here it looks like the majority will do everything it can this session to make life more expensive and less free for taxpayers and other citizens who would rather be left alone. First, there are dozens of bills to increase taxes — taxes on business, taxes on property, taxes on the use of carbon, and taxes on people’s income. No surprise about that. Governor Brown has wanted to increase state spending by something around $2 billion next biennium, mostly by pouring more money into our public school systems (so they can meet their pension obligations) and the state Medicaid program. Then there’s the attack on daily life in our communities represented by House speaker’s proposal to outlaw single-family zoning, all because there’s supposed to be a housing crisis. Instead of a crisis, what we have is an incredibly cumbersome and costly regulatory scheme covering land development and building, a scheme built up by the state over the last 40 years without regard to the consequences. At the Capitol they’re also talking about making the problem worse by authorizing some sort of rent control. The first result of that is likely to be a drop in the number of available rentals, not an increase. Either that, or a spike in the price of rent before the new controls take effect. And let’s not forget the wave of bills against gun owners, all attacking citizens who have never done anybody any harm. One proposal, SB 501, was introduced by a couple of Democrats on behalf of a group of earnest but misguided high-schoolers calling themselves Students for Change. It would create a long list of restrictions and requirements along with potential year-long jail sentences for citizens who fail to comply. Among other things, the bill would require permits to exercise the constitutional right to possess firearms. It also would ban magazines for more than five rounds, which would indirectly make useless most firearms in Oregon homes. And if that doesn’t achieve the gun banners’ desired result, Senate President Courtney has a bill subjecting shooting ranges to higher liability exposure and greater local regulation, as if he wants to drive them all out of business. How does legalizing something that was previously illegal — the construction of duplexes and quadplexes — attack our daily lives? You can still build a house on your land and no one is being forced to develop land. No reason to get all huffy about lawmakers and taxes. Using force to coerce people to pay taxes is inherently good. It is the bedrock of a free, civilized society. Politicians and bureaucrats know best what is good for all of us. Stop complaining and love your local, state, and federal governments. Precisely. With the clambering murder rate, burgeoning burglary incidents, random attacks and kidnappings throughout Albany and Linn County, its no wonder folks are buying AR15s. Five rounds of ammunition won’t cut it when one considers the drug-smuggling rapists, etc. that are pouring thru our Southern border like a screen door on a submarine, or a flash flood in a Fizzies factory. More ammo and faster rates of firing are the answer to our problem. You need to get a dictionary and a clue. Now, tell us how you *really* feel. Craig B, Since many convey alternative ideas and some very good points on social media sites, a start in the right direction …. How about sending your representatives an email and tell them what you support or don’t support. They need to know what we want and represent our interests or let it be known we won’t allow them to represent us in the next term. It’s a right nice idea, but when you look at the District map…it’s moot. Two-thirds of Oregon lies east of the Cascade Range, but there are only 5 Districts. In the Portland Metro area (Hillsboro to Gresham, the Columbia River to Oregon City) has 14/15 Districts. So all those folks who live in Eastern Oregon don’t stand a chance. And I have yet to meet a politician who truly represents the people and NOT their political party. What do you expect? They made their “re-elect me” golden pitches last summer & sure enough the “sheep” re-elected them. As long as we continue use that tired, worn out, lame “used candidate car lot” to pick from that golden speech guarantee is no good once off the lot! If the Electorate is nothing more than “sheep” then how do you explain the sheeple of Linn County who, in 2018, voted against every ballot measure that was in their interest and for every ballot measure that goes against their self interest. I wouldn’t call Lin County electorate sheep. I’d call them foolish. Have no fear, Mr. Hering. Our rookie rep, Boshart-Davis is fully capable of talking the Democrat majority off the cliff. Boshart-Davis will be at least as effective as the Olson fellow who used to occupy space in Salem. Send your letters of support to our newest legislator. As a back-bencher, she’ll likely welcome a friendly letter or two. Well there may not be a way to stop taxing Oregonian’s into the Afterlife. But, Thank Goodness, We The People have the SCOTUS! Who will No Doubt, hear every gun legislation passed by Oregon’s Anti-Gun Governor & Legislators. 2nd Amendment rights will be upheld! I was particularly pleased by Hering’s exactitude in his condemnation of government. When pundits like Hering wander off into the weeds with vague generalities to support their specious arguments, one grows weary. But not Hering. Line after line of today’s screed provided all the evidence one needs to know for certain that State government is our enemy. But not Trump. He’s above criticism because he likes seeing 800-thousand employees being evicted after not paying their mortgage. I read the entire screed, no mention of Trump at all. So why did you bring him up? I thought Hering was discussing Oregon lawmakers. to J.H. Are you blind and deaf? Pelosi says NO wall even if Trump gives dreamers and temp hi-tech workers path to citizenship. Dems are obstructing over peanuts while on vacation in luxury in Puerto Rico. Particularly when the “truth” is a sack of alternative facts, like Sara said. I resist bringing national politics into this blog, but can’t let this be. The Rs had two years to fund the border project and didn’t. A last-minute attempt by a lame-duck Congress failed. So why is the current state of affairs a Pelosi problem? I’m not a huge fan of the tax increases, however I think it is worth reminding everyone that the Republican controlled house is what gave us PERs. Not sure saddling future generations with unfunded liabilities is better than tax increases. Your response perfectly encapsulates the current hot trend of transactional thinking. Everything’s a deal, good or bad. And because everything’s subjective (transactional) then there is no need for today’s generation to honor commitments made by an earlier generation. The Trans-Actionalist believes whatever is most convenient for her/him. Thus PERS, which by the way could be a good deal and a bad deal simultaneously, is easily viewed as trash from some past, nothing we need to consider anymore. So once again, thank you, Ean, for spotlighting so precisely. Fast forward to 2019 and you blame Republicans for the problems of the current PERS system? Here’s a hint from a non-Republican – read some PERS history before making stupid comments. Lots happened to PERS in the past 74 years. In 1975, the Oregon Legislature guaranteed that retirement account earnings for Tier One members would be no less than the “assumed interest rate” set by the PERS Board. In the 1980’s the Board set the rate at 8 percent. I believe it is currently 7.5 percent. The “non-partisan” Board is appointed by the Governor. The Board sets the rate, not a political party, not the Gov, not the legislature. But the Board is political, so when things go wrong the D’s blame R’s and the R’s blame D’s. Fix blame, not the problem. That’s politics. The 8% guarantee was not the problem: the failure to set up reserves when the fund earned 20% was the problem. I heard the former treasurer (a democrat) state that the fund earned in excess of 10% over the past 25 years. What the union dominated board did was credit individuals with 20% when the fund earned it and then in the next year or so when the fund earned 1% they awarded the individuals 8% as guaranteed but if they had only awarded them 8% when the fund earned 20% and held the excess in reserves we wouldn’t have this problem and if this was a private pension plan the board would have legal problems. Not quite, regardless of who was in charge, did you see anyone contesting the 8%? My New Year’s resolution, which comes a little late, I agree, is to quit reading Hasso Hering’s hateful, right wing crap. Same, here. This blog has gotten so toxic and click-baity over the past year. So do I. I’d love to see you make some real money from this. As a more-or-less lefty, I find Avid Reader 1’s judgment absurd. Rent control is an absolutely horrible idea and the worst possible way to deal with our housing problems. That’s likely what will happen. Just bad economics. It’s like those third-world countries subsidizing gasoline, which discourages public transportation, bikes, and smaller cars. Then it becomes politically impossible to reverse the mistake. There’s another problem you might not hear about as often from conservatives. Rent control (at least New York style) creates different classes of renters depending on how long they’ve lived in a particular place, the same way as property taxes under Calif. Prop. 13 which was generally supported by conservatives. I don’t remember Oregon’s equivalent, but I think its effect was much less drastic. Either tax or rent, the old-timers have an overwhelming and grossly-unfair advantage over newcomers. By the way, I’m a renter, and mostly don’t consider myself conservative.